Actually that’s not entirely true: the beautiful bread I’m referencing above isn’t quite as quick to end up in the bin as its lower quality counterpart. The majority of bread disposed of so wastefully is shop bought bread, more specifically those plastic-packeted, regulation size slices of Styrofoam masquerading as sustenance that the supermarkets churn out each year (ahem, rant over). According to this article, because it comes pre-packaged and is so cheap, people value it less, viewing sliced bread as an expendable commodity: something that sits on the side until its exact sell by date has passed before being consigned to a landfill somewhere out of sight. I know not everyone has the time to make their own bread, or can afford the luxury of artisan loaves which (in London at least), can come in at pretty extortionate prices. But I do hate the idea of waste; that we’re throwing away food when others around the world are starving; that our economy is actually paying for what we seem to now accept as a privilege of twenty first century life. It’s not going to change the world, but there are a few things you can do to reduce your bread wastage. Making or buying the best you can afford is a good first step – if you’ve spent hours kneading your dough and waiting for it to rise, or shelled out your hard earned cash on a lovely loaf, you’re more likely to treat it with a little respect. Secondly, store it carefully – uncovered bread dries out, while plastic and foil keep too much moisture in, making the crust go soggy. Putting it in the fridge to ‘keep it fresh’ is a common misunderstanding – in fact bread stored in a refrigerator goes stale quickly as it dries out – so store it wrapped in paper or in a bread bin at room temperature for the best results. And if you know you’re not going to eat a whole loaf at once, pop some in the freezer. Although extended freezing time may make the crumb a little cardboard-y, most loaves freeze well for limited period when wrapped up properly. The third option is by far the most fun – give your bread a new lease of life with any number of exciting recipes. Whizz stale bread into breadcrumbs to coat a schnitzel or fishfingers, cut it into rounds and bake as beautiful crostini or fry little pieces with olive oil and bacon for the best crispy croutons ever. Combine with tomatoes in one of the numerous dishes which champion stale bread as their key component – Italian panzanella, pappa al pomodoro or a thick Spanish gazpacho. If your tooth is a little sweeter, breadcrumbs make brilliant crumble toppings or you could try slicing as rich French toast or baking it into a creamy bread and butter pudding. Or you could do what I did, and stir them into ice cream. Serve in big scoops with a long silver spoon . . .
As someone more than a little bit obsessed with both bread and ice cream, it was pretty much inevitable that this recipe would appear on my blog at some point. If you think brown bread ice cream sounds a little strange, take a look at the instructions in the recipe below and all will become clear. Generous crumbs of the best brown bread are tossed with nutty brown butter, sugar and pecans before being toasted into caramelized nuggets in the oven. These are then stirred through a vanilla custard base, enriched with more brown sugar and thickened with smooth cream cheese. If you’re trying to imagine the texture, it’s a little like Haagen Dazs’ Cookies & Cream – slightly chewy crumbs of sweet, sugary goodness in a rich, custard base. The flavour isn’t entirely unlike cereal milk – think Weetabix or Bran Flakes – and although my version is based an old Irish recipe, I think Momofuku’s Christina Tosi would approve. The recipe below makes a fairly large quantity of caramelized breadcrumbs. Greedily I stirred the whole lot through, which makes for quite a thick, chunky ice cream, but if you’re looking for something slightly simpler and smoother, stir about two thirds through your custard and reserve the rest for sprinkling on top when serving. You may also end up eating them by the handful – for something that might otherwise have ended up in the bin, they taste pretty damn good. I’m on holiday in Barcelona from 11th – 22nd June, but please do leave any comments or questions and I’ll reply as soon as I’m back! Crumble the bread into pieces, about the size of a pea or smaller. Alternatively you could whizz them in a blender, but I like the slightly chewier consistency that larger chunks give. Heat the butter in a saucepan until melted, then continue to cook until it starts to brown and the milk solids are nutty and toasted. Remove from the heat and stir in the breadcrumbs, sugar, pecans, cinnamon and salt. Spread on a baking tray and bake for 25 – 30 minutes, stirring occasionally, until crispy, toasted and a deep, dark brown. Heat the milk and 200ml of the double cream in a medium saucepan with the sugars and salt. Put the remaining 250ml double cream and cream cheese in a medium sized bowl. Set a sieve over the top and place in an ice bath. In a separate bowl, whisk the egg yolks until light and frothy. Gradually pour in the warmed milk mixture, whisking constantly. Scrape the warmed yolk and milk mixture back into the saucepan and return to a low heat. Cook your custard, stirring constantly, until thickened enough to coat the spatula. Pour the custard through the sieve into the cold cream and cream cheese mixture then whisk until smooth. Stir in the vanilla extract. Refrigerate until well chilled, preferably overnight, then churn in your ice cream maker. Once frozen, quickly fold in the breadcrumbs – the whole amount for a thick, chunky ice cream or two thirds for something a little smoother (see above), then store in the freezer until ready to serve. This ice cream is delicious with fresh fruit or compote (think toast and strawberry jam), and also works really well with chocolate sauce or in a sundae with whisky-whipped cream. Oddly, given that I don’t like brown bread that much, I do love brown bread ice cream. With the addition of pecan nuts, I reckon I’d love it even more! 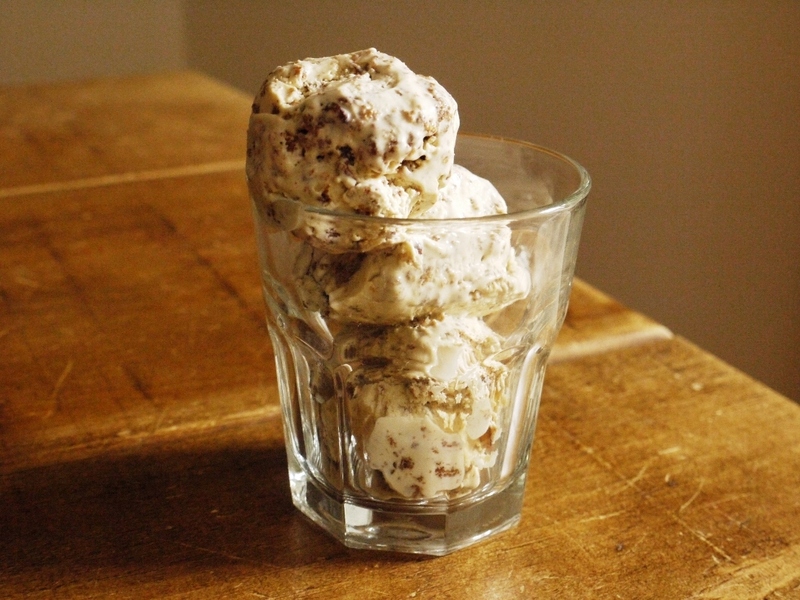 I had to read the title twice to be sure – brown bread in ice cream? Sounds absolutely delicious with the butter and pecan and looks amazing. I would love to try some! Have fun in Barcelona! This looks delicious and I wish I could eat it! Is there anyway anyone knows of making ice cream that is dairy and egg free?? I so miss ice-cream – I make it for others but not for me. I know you can buy it but thats just not so fun! I am simply going to have to dust off (literally) my ice cream maker and make this. It just sounds wonderful. Now this looks amazing! I’ll bet the textures with the crunchy delicious, sweet breadcrumbs are divine! And im going with two-thirds purposefully, to leave some nice snacks. After all, it’s practically granola. In fact, just like st. John doughnuts and certain bacon, bourbon and pecan brownies this IS breakfast food! 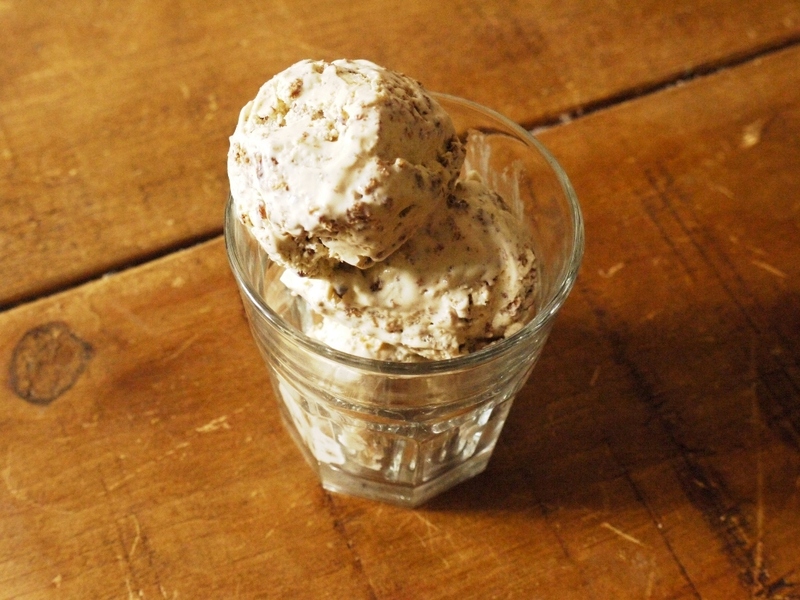 Bread like granola AND toast; ice-cream custard like cereal milk; good-fats nuts: it’s a sure thing. Looks like amazing icecream! Perfect for summer. This sounds so good! I always appreciate your creativity. 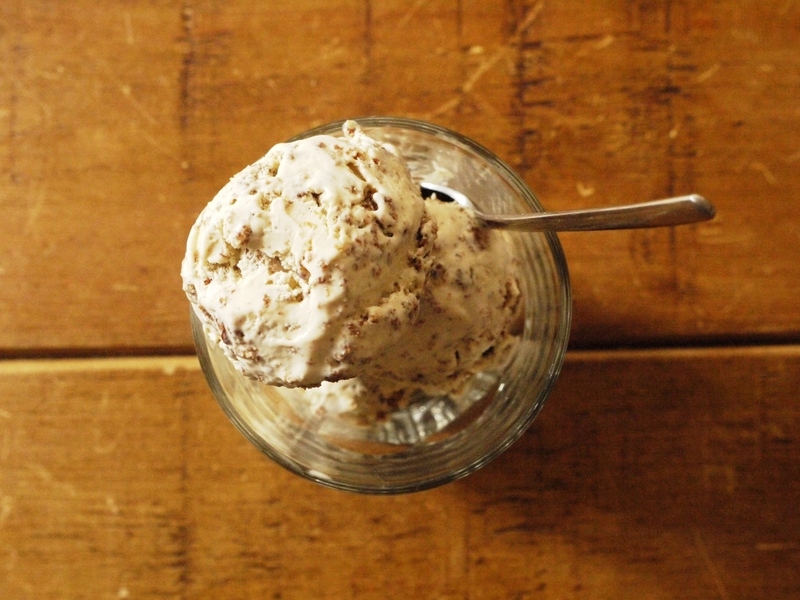 I’ve never had brown bread ice cream but it’s just one of those things I KNOW I would like. Especially with pecans – so good! Don’t even get me started on supermarket bread. I had to have some the other day at my boyfriend’s as he had no other bread, and it was a tragic experience. That is such an original idea! 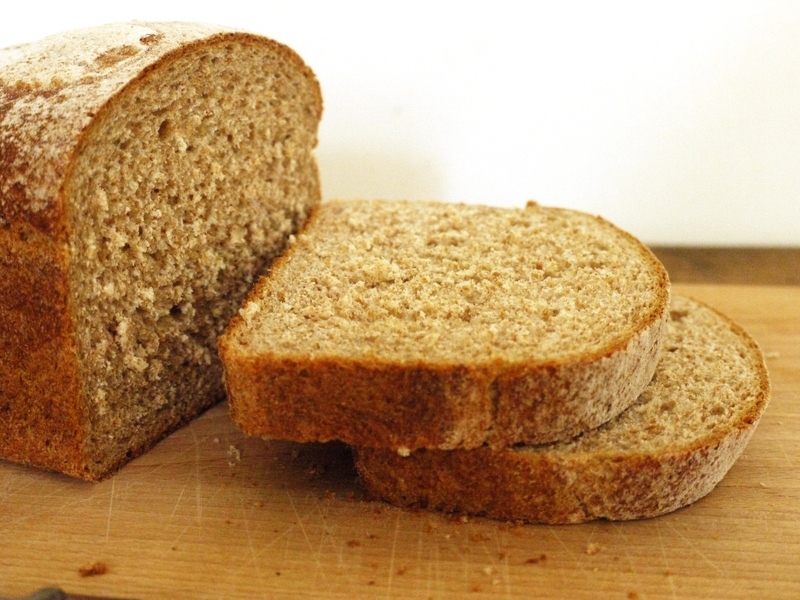 It sounds like a great way to make stale bread hip and exciting again. Caramelised, oooh.It’ s funny though, I never have leftover bread because I don’t even buy bread much. Maybe because I grew up in an asian household, so bread never was a huge staple; I always have leftover rice in the fridge on the other hand. I couldn’t agree more, I found myself nodding vigorously constantly while reading this post. I felt like I could have written it from A to Z, although maybe not as well. Every word is true and I find this recipe for ice cream really enticing, although I unfortunately do not own an ice cream machine. I have a paper bag full of stale bread lying in my kitchen and the last I used was in the asparagus gazpacho I just posted about. I am trying to get into the habit of never buying breadcrumbs again. Have a lovely time in Barcelona! 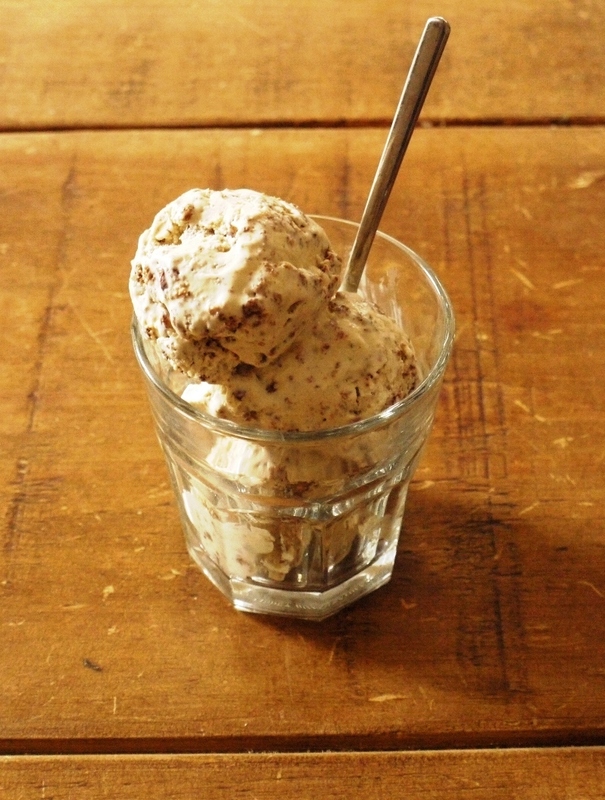 Have you been to Heston’s Dinner and had the brown bread ice cream there? It’s served with salted caramel and little chunks of pear and it’s the stuff that dreams are made of. Love the idea of being able to recreate it at home! Kavey – the nuts are a really lovely addition – nice to have some extra crunch alongside the chewier bread nuggets. 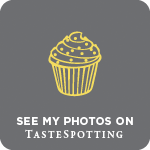 Baking Addict – you have to try it, it’s so good! Cake Boule – have you tried using soya milk or something like almond milk and making ice cream without a custard base? It won’t taste exactly the same but would probably be pretty good! Ruth – sweet breadcrumbs are the best! Terra – it’s awful how much food is wasted around the world, let’s hear it for leftovers! Claire – I could happily eat a bowl of this for breakfast! Lisa – exactly 🙂 It’s so good. Shuhan – hmmm, maybe you could make some kind of leftover rice pudding ice cream…? Nuts About Food – absolutely, homemade breadcrumbs are so much better and freeze really well too. Kathryn – I’ve not yet been to Dinner but the sound of that pudding alone makes me want to go!